Badge Engineering-Where Is The Identity? | Business Article | MBA Skool-Study.Learn.Share. Badge Engineering-Where Is The Identity? Most of us (read car enthusiasts) living in India might have noticed this very conspicuous trend of finding striking ‘head to toe’ similarities between cars coming from different stables. Sometimes as they pass by they leave you wondering ‘did I see a different logo/badge on that grill?”. Yes that’s it, the ‘badge’. The symbol that differentiates each automobile manufacturer, the symbol that brings in identity, the symbol that screams out loud to the customer about the brand and which in turn brings in brand loyalty. So why loose your identity as a car manufacturer? Why disappoint your loyal customers who take pride in owning your vehicles and then find the same features and design in another brand. Yes there are a lot of questions to be answered about why automobile manufacturers (read car manufacturers as the references are mostly towards them) resort to what it is called – ‘Badge – engineering strategy’. So what exactly is Badge – engineering? It is the process by which any automobile manufacturer uses its logo and some minute tweaks to design (external & internal) to an existing model or a model of another manufacturer/brand. It is not a new phenomenon but has been conspicuous in recent times. It is a marketing gambit to push the sales of similar products which come under different brand names. So what are the main reasons that urge companies to do this? Well it can be attributed to ‘Time’ and ‘Money’ .To be more precise the time and cost of design, manufacturing and launching the products through badge engineering is comparatively lower than when you are on your own. I would request the readers to go back some years and remember what wonders the Fiat Quadrajet diesel engine did when it was mated with the gear boxes of both Tata Indica Vista and the Maruti Suzuki Swift. But this was not an evident alliance at least to the less knowledgeable car owners. So this can be considered as a precursor to the badge engineering strategy where not only engine/parts design but also the the entire gamut of assembly lines, labour, platforms etc are shared. We have all heard this idiom “Experience is the best teacher”. Experience gives us examples from the past which we can relate to and on which we can improve our present. Hence siting an example will be most appropriate to understand badge engineering. Yes folks it’s the alliance between the French car manufacturer Renault and its Japanese counterpart Nissan. The alliance dates back to 1999.A crucial factor that has held the alliance together was that both these Auto-giants operated in mutually exclusive markets. The major plus point of Renault is its financial clout and the stylish European design that it brought into the equation, while Nissan like any Japanese car manufacturer had technological as well as operational excellence on it’s side. Hence when they came together it was a win-win situation for both the companies. Even though Renault has a major stake in Nissan, they operate as different entities with collaboration in technology, assembly line etc. Even though most of badge engineering happens with car manufacturer alliances, there have been exceptions also. One such example will be that of the luxury car Aston Martin Cygnet which was actually manufactured by the Japanese giant Toyota. It was actually a modified version of the Toyota iQ. Hence badge engineering is more of tightening the budget through alliances which helps to increase margins by cutting down design and manufacturing costs. The cost savings are also brought about through savings in Research and Development. There are various reasons why car manufacturers resort to badge engineering. As mentioned earlier it is basically to reduce manufacturing, R&D as well as other costs. To site an analogy we can take up the example of how the same manufacturer makes T-shirts for sports equipment/apparel giants like Nike, Adidas and Reebok. And to get into the economics of this, yes the manufacturer banks on economies of scale and reaps a cool percentage from each product. The big companies in turn charge a price premium on these apparels and they make big money. Badge engineering is done also to reduce the time period required to roll out a product into the market. For example Ford had to do years of research to roll out the Figo in India. It would never happen in the case of a badge engineered vehicle as it might mostly be developed on the platform of other tried and tested models in the market. It can also be done when there is a number of brands which fall under the same family like the case of Fiat (right from Punto to the Maserati).It has cars in various segments. If for example a particular car in a lower segment has done well and some of its performance/design elements catch the eye of buyers from a higher segment, then the company can tweak the car and make some appendages to cater to the luxury class. Another reason for the adoption of badge engineering will be when a particular manufacturer doesn’t have a car to be offered in a particular segment for a market. We don’t have to wrack our brains for an example. The soon to be launched Nissan Terrano would have taken at least 5 years if it had been done on a new platform. Instead Nissan badge engineered it on the much acclaimed Renault Duster. There are good days and bad days, there are good guys and bad guys similarly everything has its advantages and disadvantages. Let’s look at some of the pros and cons of badge engineering. Quick launches in newer markets enabling the reach of the company. This can be true for Renault in India when it entered the small car segment. Lesser risk involved when it is done on a tried and tested model in a market. For example the Duster was ‘the car’ when it was launched and the Terrano need not break a sweat in convincing the masses about its performance capabilities. Reduced costs due to sharing of technology and other resources. Both Vincent Cobee(Corporate VP , Nissan)and Marc Nasiff(MD , Renault India) have admitted that even though there has been a lack of variety , badge engineering has really helped their respective companies to get better R O I in India. Cannibalization – This happens when the badge engineered product is launched in the same market as that of the model on which it is based on. For example during the period 2012-13, in which the Renault Pulse was launched in India , 465 units were sold. 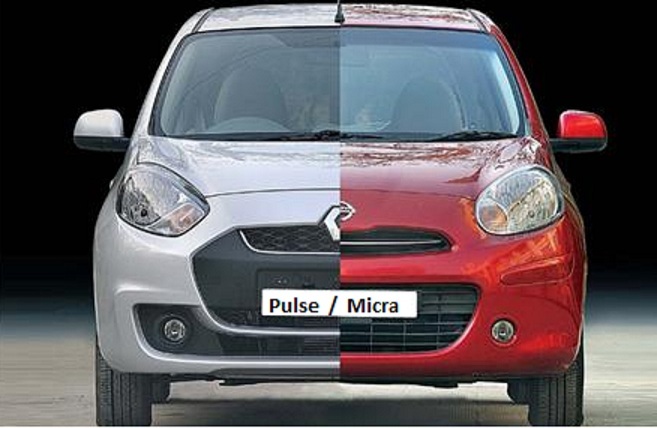 But at the same time the sales of the Nissan Micra on which the pulse is based on fell from 1553 units to 955 units. These figures are based on data published by the Society of Indian Automobile Manufacturers (SIAM). It can turn out to be an indicator of incompetency of a manufacturer to provide something different to the customer given that there are numerous websites that do post-mortem of a particular model soon as it is wheeled out. Forget incompetency, it also leads to a lot of dependency on the other manufacturer and if they operate in the same market, this leads to conflict of interest. Lack of identity as well as variety to the customer. It is kind of an ‘Old wine in new bottle’ strategy which can be a dud in markets like India with lot of conscientious auto customers. With all its pros and cons badge engineering is a cost effective and conservative strategy and this helps when there is an uncertainty in the auto market. May be companies can adopt this and gain a foothold in a market and later on go their own ways. Even the new Terrano is not entirely the Duster and tries to target much more affluent customers. But on a personal note, ‘Variety is the spice of life’, and I would love to see variety in design as well as other specs among cars that are launched. Au revoir and Sayounara !